Background and objectives: Despite potential significance of fatigue and its underlying components in the occurrence of cardiovascular diseases, epidemiologic data showing the link are virtually limited. This study was designed to examine whether fatigue symptoms or fatigue's underlying components are a predictor for cardiovascular diseases in high-risk subjects with ESRD. Design, setting, participants, & measurements: 788 volunteer patients under hemodialysis therapy (506 male, 282 female) completed the survey between October and November 2005, with the follow-up period up to 26 months to monitor occurrence of fatal or nonfatal cardiovascular events. The questionnaire consisted of 64 questions, and promax rotation analysis of the principal component method conceptualized eight fatigue-related factors: fatigue itself, anxiety and depression, loss of attention and memory, pain, overwork, autonomic imbalance, sleep problems, and infection. Results: 14.7% of the patients showed fatigue scores higher than twice the SD of the mean for healthy volunteers. These highly fatigued patients exhibited a significantly higher risk for cardiovascular events (hazard ratio: 2.17; P < 0.01), with the relationship independent of the well-known risk factors, including age, diabetes, cardiovascular disease history, and inflammation and malnutrition markers. Moreover, comparisons of the risk in key subgroups showed that the risk of high fatigue score for cardiovascular events was more prominent in well-nourished patients, including lower age, absence of past cardiovascular diseases, higher serum albumin, and high non-HDL cholesterol. Conclusions: Fatigue can be an important predictor for cardiovascular events in patients with ESRD, with the relationship independent of the nutritional or inflammatory status. The importance of behavioral and psychosocial factors in the prevention, development, and treatment of cardiovascular diseases (CVDs) has been increasingly recognized in the medical and scientific communities (1–3). Physical and mental activities, including anger, sadness, frustration, and tension, can trigger daily life ischemia in patients with coronary artery disease (1,4–6). The presence of mental stress-induced ischemia is associated with significantly higher rates of subsequent fatal and nonfatal cardiac events, potentially mediated by the occurrence of myocardial ischemia (7). Conversely, the addition of psychosocial treatments or stress management to standard rehabilitation regimens is shown to reduce mortality and morbidity in patients with acute myocardial infarction (8,9). Among behavioral and psychosocial factors, fatigue is an important bio-alarm for human health, as well as fever and pain (10). Fatigue has come to be recognized as a newly recognized important syndrome (chronic fatigue syndrome) (11–13), as well as a serious symptom of many chronic illnesses. Fatigue can not only significantly impair a person's functioning and have a negative effect on his or her health-related quality of life (QoL), without which a person might drop into unrecoverable exhaustive state and, in the most severe case, can even die, referred to in Japanese as Karoshi. The major medical causes of Karoshi deaths are heart attack and stroke due to stress (14,15). Despite the potential significance of fatigue symptoms in the occurrence of CVD, epidemiologic data showing the link are virtually limited. Hardy and Studenski (16) recently reported that a single simple question, “Do you feel tired most of the time?” identifies older adults with a higher risk of mortality. Epidemiologic evidence also suggests that vital exhaustion as assessed by simple questionnaires belongs to the precursors of different manifestations of coronary artery disease (17–19). Although the vitality construct captures a mild reduction in energy level, it fails to capture the negative aspects of fatigue, such as weakness, lack of motivation, and difficulty with concentration (20,21). Thus, these reports emphasize the need to identify and characterize the significance of fatigue and its underlying components (overwork, autonomic imbalance, depression and anxiety, loss of attention, etc.) to develop and test specific treatments, and to determine whether improvement leads to decreased morbidity and mortality. Moreover, it is intriguing to test whether fatigue and its related components are predictors for cardiovascular events in subjects at higher risk, such as patients with ESRD (22). Fatigue is one of the most frequent symptoms of patients with ESRD undergoing maintenance dialysis therapy. The prevalence of fatigue ranges from 60% to as high as 97% in ESRD patients on long-term dialysis therapy (23–26). Recognition of fatigue in dialysis patients may be difficult because recovery from fatigue has great interpatient variability (27). Despite the importance of fatigue symptoms in ESRD patients, both the presence and severity of fatigue remain largely unrecognized (28). In this study, we surveyed the prevalence and severity of fatigue in 788 hemodialysis patients by using recently established new fatigue scale (29). We examined whether the subjective fatigue scores can be a predictor for future cardiovascular events. The outpatient chronic dialysis hospitals in the Osaka district of Japan participated in this protocol. A total of 1927 dialysis patients in the Osaka district (Inoue Hospital (n = 972), Shirasagi Hospital (n = 815), and Okada Clinic (n = 140)) were asked to participate in the survey, and 850 patients (44.1%) completed the survey. Peritoneal dialysis patients (n = 62) were excluded, and the data for 788 hemodialysis patients (male: n = 506; female: n = 282; Inoue Hospital, n = 343; Shirasagi Hospital, n = 333; and Okada Clinic n = 112) were used for final analyses. All survey-completing patients agreed to be enrolled in the study, and written informed consent was obtained from all participants. The protocol of the study was approved by the ethics committees at the Osaka City University Graduate School of Medicine (approval no. 1217) and at individual hospitals. The survey was performed between October and November 2005. Clinical characteristics of the patients are shown in Table 1. For validation of the 64 items on the questionnaires, fatigue score and its related components were compared with Chalder fatigue scale (20) and Kidney Disease Quality of Life (KDQoL) questionnaires (n = 143) (30). Basal data from the clinical trial “Efficacy of the nutrient supplement ‘AMP01’ for the fatigue of the hemodialysis patients” (UMIN000001055) were used for the analyses. This clinical trial was designed to examine the efficacy of nutrient support on subjective (questionnaires) and quantitative (autonomic function, viral reactivation, and hormonal levels) measures for fatigue. The questionnaire associated with fatigue scale (Table 2) consisted of 64 questions as described previously (29). The subjects were asked to rate how often in a recent week they experienced the symptoms, using a Likert scale (0 to 4). Eight factors were calculated as a result of principal factor analysis with promax rotation, and these were named as fatigue, anxiety and depression, loss of attention and memory, pain, overwork, autonomic imbalance, sleep problems, and infection. Forty-two questions (footnote in Table 2), which did not overlap among scales (load >0.4), were used to calculate each scale. Because each factor has a different number of questions, each score is recalculated to go up to 20 points. To obtain reference values for each factor, the volunteers in the Osaka Clinical Trial Volunteer's Association organized by the Center for Drug & Food Clinical Evaluation, Osaka City University Hospital, Osaka, Japan, were asked to complete the 64-item questionnaire. The questionnaire was sent to 328 consenting participants in September to December 2007, and all subjects completed the survey. The subjects with known diseases or taking medications were excluded, and the data of 171 healthy volunteers (age: 45.4 ± 14.0 years; male: 29.8%) were used to calculate reference scales. The means and SDs of the eight factors are 5.2 ± 4.1 (fatigue), 4.1 ± 3.8 (anxiety and depression), 6.0 ± 4.3 (loss of attention and memory), 3.9 ± 3.3 (pain), 4.0 ± 4.0 (overwork), 1.6 ± 2.4 (autonomic imbalance), 4.7 ± 4.2 (sleep problems), and 1.5 ± 2.7 (infection). The patients with the scores exceeding twice the SD of the mean of healthy subjects were considered a highly scored group, and the outcomes were compared with the normal group (equal or less than mean +2 SD of healthy). The laboratory values were measured immediately before the initiation of dialysis treatment. All laboratory measurements were performed by routine assays by use of automated methods. The subjects were followed up to December 2007, with a median follow-up period of 26 (1–26 months) months. Date and cardiovascular events were obtained by reviewing the clinical records by physicians in individual hospitals who were blinded to patients' fatigue scores. For the patients that moved away to other dialysis units, we reviewed the questionnaire forms filled by the attending physicians at the units. Primary outcome was fatal or nonfatal cardiovascular events. During the follow-up, 82 fatal (n = 15) and nonfatal (n = 67) cardiovascular events occurred. Fatal cardiovascular events included five acute myocardial infarctions, two ischemic strokes, four hemorrhagic strokes, two ischemic bowel diseases, and two sudden deaths, which was defined as a witnessed death that occurred within 1 hour after the onset of acute symptoms, with no evidence of accident or violence. For nonfatal cardiovascular events, ECG-documented anginal episodes and myocardial infarction (n = 42), as well as ischemic (n = 15) or hemorrhagic (n = 10) stroke documented by computed tomography or magnetic resonance imaging was accurately recorded. As the secondary outcome, the date and all causes of death events were recorded. The 48 deaths included cardiovascular events (n = 15), cancer (n = 3), infectious disease (n = 11), liver cirrhosis (n = 1), acute pancreatitis (n = 1), uremia (n = 1), pulmonary edema without any evidence of myocardial infarction (n = 3), hyperpotassemia (n = 3), and death of unknown causes (n = 10). Continuous variables were summarized as mean ± SD. Median (limits of observed values) was given for duration of hemodialysis, C-reactive protein, and the follow-up periods because of their skewed distribution. Factors associated with high fatigue score were evaluated by logistic regression analyses. Survival curves were estimated by the Kaplan-Meier method with logrank test. Prognostic variables for survival were examined using the univariate or multivariate Cox proportional hazards regression models. P values less than 0.05 were considered significant. All of these analyses were performed using SPSS version 15 (SPSS Inc., Tokyo, Japan) or StatView 5 software (SAS Institute Inc., Cary, NC). We first examined the reliability and validity of the 64-item questionnaire in ESRD patients. In ESRD subjects, conceptualized eight factors [(1) fatigue; (2) anxiety and depression; (3) loss of attention and memory; (4) pain; (5) overwork; (6) autonomic imbalance; (7) sleep problems; and (8) infection] accounted for 52.5% of the total variance. Cronbach α for each factor was 0.91, 0.92, 0.89, 0.82, 0.86, 0.71, 0.74, and 0.64, respectively. In 143 hemodialysis patients, the correlation coefficients between the factors and Chalder fatigue scale were 0.72, 0.74, 0.66, 0.54, 0.22, 0.48, 0.49, and 0.27, respectively. Each coefficient showed statistical significance. The fatigue score (factor 1) was strongly and inversely associated with vitality (r = −0.66), emotional role (−0.50), symptoms/problems (−0.62), and effect of kidney disease (−0.52) in KDQoL, with all relationships highly significant (P < 0.001). The fatigue score was also significantly (P < 0.05) and inversely associated with many of the components of KDQoL: physical functioning (r = −0.30), physical role (−0.36), bodily pain (−0.46), general health (−0.44), social functioning (−0.32), burden of kidney disease (−0.48), cognitive function (−0.43), quality of social interaction (−0.42), sleep (−0.42), social support (−0.18), and dialysis staff encouragement (−0.20). The fatigue score was not significantly associated with work status, sexual function, and patient satisfaction. The survey exhibits that 14.7% of the patients belonged to the highly scored group for fatigue score. Logistic regression analyses revealed that only higher age and higher serum glucose levels were positively and significantly associated with high fatigue score, whereas gender, dialysis duration, diabetes, hypertension, CVD history, body mass index (BMI), BP, blood hemoglobin, serum C-reactive protein (CRP), albumin, and non-HDL and HDL cholesterol were not significantly associated (data not shown). The outcomes for cardiovascular events of the highly fatigued patients were compared with the rest of the patients (equal or less than mean +2 SD of healthy) by Cox proportional hazards model. As shown in Figure 1A, highly fatigued patients exhibited significantly (P = 0.008) higher risk for cardiovascular events than normal-score patients (hazard ratio: 2.17; 95% confidence interval: 1.23 to 3.85). Kaplan-Meier analysis also confirmed the findings (Figure 1B). The percentage of high scores for other fatigue-related factors, including depression and anxiety, loss of attention and memory, pain, overwork, autonomic imbalance, sleep problems, and infection were 12.5, 8.4, 26.9, 8.0, 26.1, 8.3, and 17.5%, respectively (Table 1). However, in contrast to the high fatigue score, all of the high scores failed to significantly predict cardiovascular events in this cohort (Figure 1A). Higher age, presence of diabetes, and past CVD history were also the significant risks for cardiovascular events in these patients (Figure 1A). None of the eight components, including fatigue, were significantly associated with total mortality in this cohort (data not shown). Fatigue score is a predictor for CVDs in patients undergoing hemodialysis treatment. (A) Univariate Cox proportional hazard analyses. For fatigue factors, the score exceeding twice SD of the mean of healthy subjects is represented as “high.” For continuous variables, data were expressed per 1 SD to make the variables scale and unit invariant. †, P < 0.01. CI, confidence interval. (B) Kaplan-Meier analyses for the association between high fatigue score and cardiovascular events. To examine whether the association between fatigue symptoms and occurrence of cardiovascular events was independent of the other potential confounders, multivariate Cox proportional hazards analyses were performed. When significant risk factors identified in Figure 1A were used for variables, fatigue score, age, diabetes, and CVD history were all still significantly and independently associated with cardiovascular events (Table 3). 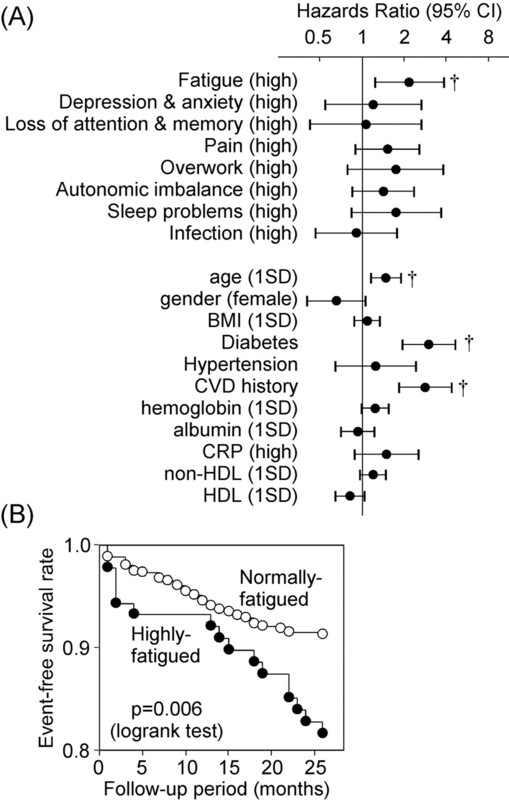 Moreover, association of high fatigue score with cardiovascular events was hardly affected, even when it was adjusted for other covariates, including gender, hypertension, BP, BMI, hemoglobin, CRP, albumin, glucose, and non-HDL and HDL cholesterol (data not shown). Comparisons of the risk in key subgroups showed that the risk of high fatigue score for cardiovascular events was more prominent in the subgroups of patients with lower age, no CVD history, higher albumin, and high non-HDL cholesterol (Figure 2). When baseline risk factors were compared between event (−) and (+) subjects (Table 4), classical risk factors, in addition to high fatigue score, were higher in the events (+) group. However, in well-nourished subjects without diabetes and CVD history (n = 338), all classical risk factors did not show significant difference, with prevalence of high fatigue score being still significantly higher in events (+) than events (−) subjects. Comparisons of the risk of high fatigue score for cardiovascular events in key subgroups as analyzed by Cox proportional hazard analyses. Age, BMI, hemoglobin, albumin, CRP, non-HDL, and HDL were divided into high and low groups on the basis of the medians. *, P < 0.05; †, P < 0.01. CI, confidence interval. In the subgroup of patients without the CVD history, Kaplan-Meier and Cox proportional hazard analyses revealed that factors of overwork (hazard ratio 2.52) and autonomic imbalance (hazard ratio 1.96) were also significantly (P < 0.05) associated with occurrence of cardiovascular events (data not shown). Our current results clearly show that fatigue is an important predictor for cardiovascular events in a high-risk population, namely, ESRD patients under hemodialysis treatment. Furthermore, using the fatigue-related 64-item questionnaire, we addressed which of the eight conceptualized fatigue-related factors (fatigue itself, anxiety and depression, loss of attention and memory, pain, overwork, autonomic imbalance, sleep problems, and infection) are important to predict cardiovascular events, and demonstrated that fatigue itself is the strongest predictor. Patients with ESRD are also reported to have a substantially elevated cardiovascular mortality rate (31), and in this population, cardiovascular risk factors can be classified as either “traditional” or “nontraditional” (32). Importantly, the association of fatigue with cardiovascular events is independent of the traditional risk factors, including age, presence of diabetes, and CVD history. In dialysis patients, malnutrition and inflammation were also identified as “nontraditional” risk factors (32), which are also conceptualized as malnutrition, inflammation, and atherosclerosis (MIA) syndrome (33). MIA syndrome is shown to be associated with an exceptionally high mortality rate. Of note, cardiovascular risk of highly fatigued patients is independent of any of the markers for malnutrition (BMI, albumin), inflammation (CRP), and atherosclerosis (CVD history). Moreover, comparisons of the risk of fatigue in key subgroups unveil specific characteristics of the patients whose fatigue is at great risk for cardiovascular events: lower age, no previous CVD, high BMI, high albumin, and high non-HDL cholesterol. These characteristics apparently are exhibited in well-nourished subjects, and they apparently reside outside of the population of MIA syndrome. In our cohort, univariate Cox proportional hazards analyses revealed that important components of MIA syndrome, low albumin, high CRP, and CVD history, were all significantly associated with all-cause mortality (data not shown). Thus, in spite of significant effects on cardiovascular events, the effect of fatigue on total mortality could be overwhelmed by the nutritional and inflammatory problems in dialysis patients, which could be the potential reason why fatigue dimension is related only to cardiovascular events but not to total mortality in our cohort. An explanation may fit to the observation that fatigue is not significantly associated with cardiovascular events in an elderly population (Figure 2). When history of cardiovascular events, BMI, and serum CRP were included as covariates in multivariate Cox analyses, high fatigue score was significantly and independently associated with cardiovascular events in this subgroup (hazard ratio: 2.84; 95% confidence interval: 1.23 to 6.58). It appears that the fatigue domain in our instrument could represent a dimension distinct from QoL. The coefficients of correlations of our fatigue score with the majorities of the components of KDQoL were not necessarily high. Furthermore, impaired health-related QoL was shown to be closely related to malnutrition and inflammation (34), in sharp contrast to a lack of relationship of the fatigue score in this study. Recent systematic review also revealed that health-related QoL in ESRD was most affected in the physical domains, and nutritional biomarkers are most closely associated with these domains (35). Impaired QoL was shown to be associated with hospitalization and mortality in hemodialysis patients (34,36–38). Very recently, Jhamb et al. (39) showed in a cohort of 917 incident hemodialysis and peritoneal dialysis patients that low vitality scale as measured by SF-36 was associated with inflammation, other low QoL scores, and with poor 1-year survival. Thus, as compared with our fatigue scale, QoL scores including vitality better reflect nutritional and inflammatory status in dialysis patients, which could be related to mortality and hospitalization rather than occurrence of cardiovascular events. Although this study is the important first step to unveil pathophysiological significance of fatigue symptoms in the occurrence of cardiovascular events, there are many steps forward to be clarified. Can our novel fatigue score predict cardiovascular events in the general population or other patients with disease? Can a quantitative marker for fatigue be a good biomarker to predict cardiovascular events? Can improvement of fatigue lead to decreased morbidity? All of these steps are crucial to highlighting the significance of fatigue as an important piece of risk predictors for CVD in patients with ESRD. This work was supported by the 21st Century COE Program “Base to Overcome Fatigue” from the Ministry of Education, Culture, Sports, Science and Technology of Japan, and was partly supported by grants from Japanese Ministry of Health, Labor and Welfare. : Preface and mini-review: Fatigue science for human health. In: Fatigue Science for Human Health, edited by Watanabe Y, Evengard B, Natelson BH, Jason LA, Kuratsune H New York, Springer, 2008, pp V–XI.